An absolute necessity for luxury lovers. 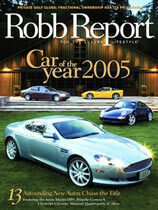 Every month Robb Report brings you the best life has to offer with features on exotic automobiles, boats, exclusive travel destinations, watches, jewelry and much, much more. If you have heard of Patek Philippewatches, then you were meant to purchase one. Easier said than done, right? Wrong. Once you get into the right frame of mind, you'll know that purchasing a Patek Philippe watch is one of the smartest investments you'll make. While diamonds are a girl's best friends, an elegant watch can take a man's image to a whole other level... in the nick of time. ... Patek Philippe official site.